Dress: Shop Norka c/o (obsessed), Shoes: Zara similar here and here and looove these, Clutch: Gigi New York c/o, Necklace: Purple Peridot c/o, Earrings: Kendra Scott (obsessed), Bracelets: J.Crew similar here, J.Crew, Watch: Kate Spade, Sunglasses: Celine similar here and here, Lips: Stila fiore, Nails: Essie (find me an oasis) Like I said last week I am loving all the shades of blue for Spring. So I was so excited when I got this maxi dress in the mail from Shop Norka. I have already worn it two times. It is so comfy! Oh and did I mention it is only $48! Such a steal. With all that is involved with the IVF process I know I am going to be living in loose comfy clothes. And with this dress I can still feel really cute! Now onto today's fun giveaway! 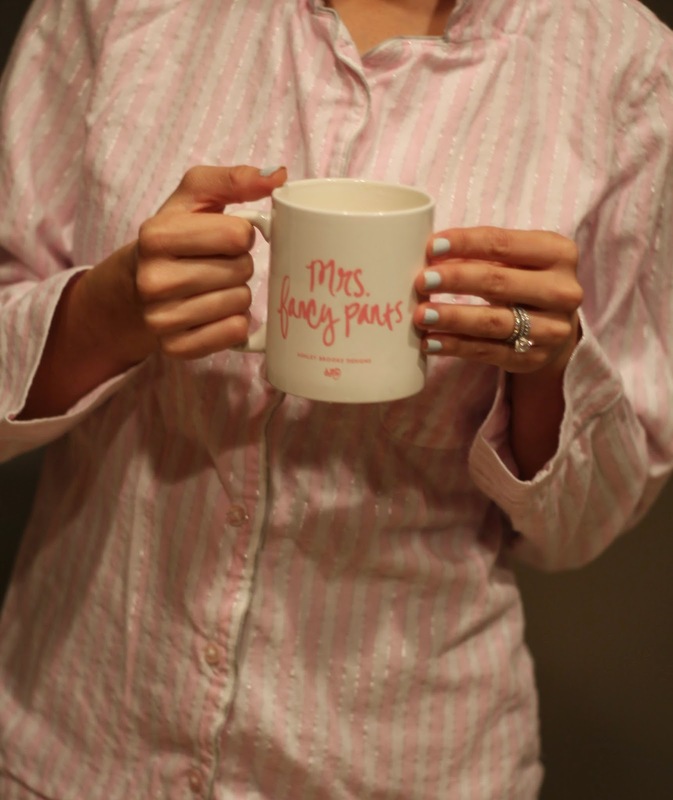 How cute is this "Mrs Fancy Pants"mug? I love a fun coffee mug. 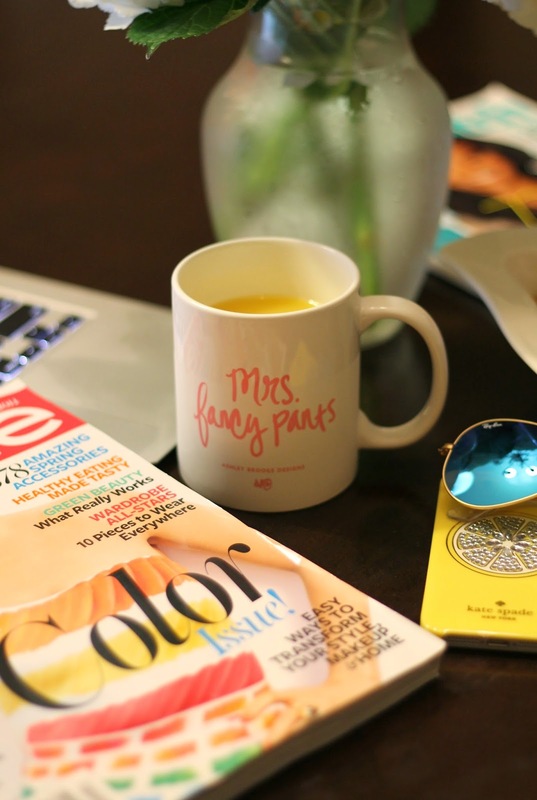 Today I have teamed up with Ashley Brooke Designs to giveaway one "Mrs Fancy Pants" mug to one lucky reader! If you guys haven't heard of or checked out Ashley Brooke Designs you must! They seriously have the cutest Things. Coffee mugs, custom illustrations, Paper goods, T-shirts... I am so obsessed with all of their adorable items. So like always to enter use the rafflecopter widget below. The more entries you complete the better chance you have at winning! The giveaway will run for a week. And I will email the winner once the giveaway is over! So make sure to follow Ashley Brooke Designs! I know you guys are going to love their stuff! looking so summery! love the colours! I love everything about this look!! That dress, clutch, and necklace, are perfect together! Such a beautiful dress, those colors are amazing on you. Love this outfit- especially the clutch!! And what a cute mug! You look so pretty! Love this maxi dress and that monogrammed clutch. Beautiful!! I love maxi dresses! I love AB Designs! I always follow her stuff, she's just so creative in everything she does!!! Such a beautiful dress! Love how you've styled this look! Such a pretty dress and adorable mug! That maxi dress is gorgeous and I love your monogram clutch! I love your maxi dress! So cute!